"Welcome to the clubs history site. 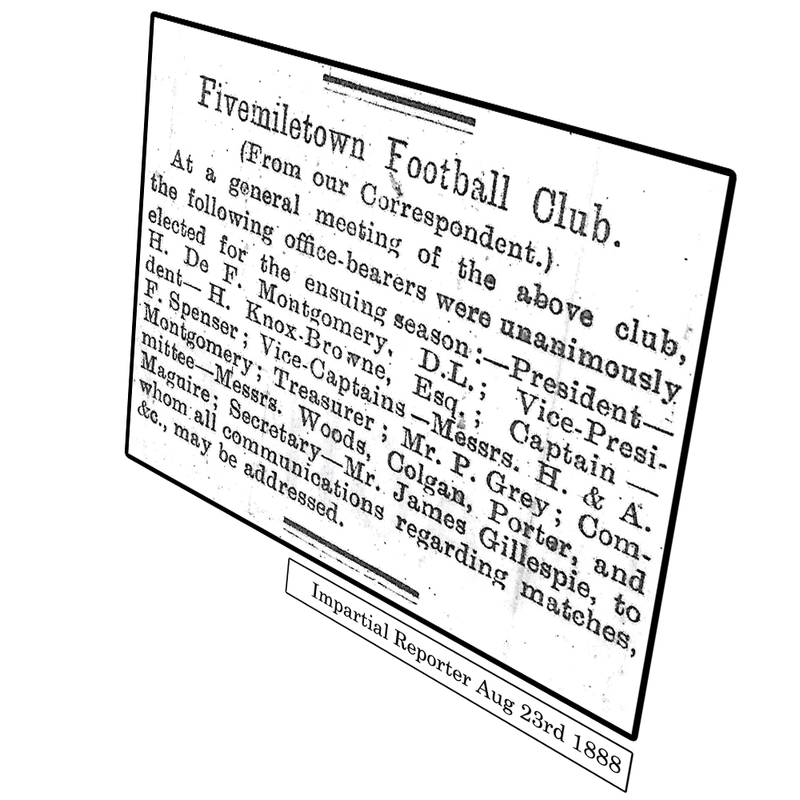 My name is Mike Long, and this site contains research I have been doing, mainly for my own curiosity but also for the past, present and future members of Fivemiletown United football club. Hope you find it interesting." Oh, why did I start this? Being slightly bored and with a bit of time on my hands I needed something to do, I needed something to get my teeth into, so to speak, but what? and my main interest at the moment is football or to be more precise my local football club. I have been involved with this club for a number of years doing a whole range of duties ranging from a manager, ticket seller, fundraiser, odd job man and everything in-between. It’s something I enjoy doing, volunteering for a few hours a week doing whatever is required, being involved in a club that brings football to the surrounding area for primary school children right through to senior level. So I am already helping at the club; what else could I do? there have been a couple of past players who started looking into it but work and family commitments meant they never had enough spare time to spend on the project and just ran out of steam but what they had uncovered gave me a great starting point. So with most of the work done (or so I thought), I would try and fill in the gaps and just bring the clubs history right up to date. In hindsight, this was a bit naïve of me, and it wasn’t long before I realised this was going to be a long slow process. After spending a while with Mr know it all, I discovered there wasn’t actually anything on the club out there, absolutely nothing, but I did pick up a few tips on where to look, the main source of information would probably be at the local library using microfilm of old newspapers of the time, this means some good old-fashioned legwork, so off I went to the local library in Enniskillen about 18 miles or so away and they did indeed have what I was looking for, the only problem is, there was so much of it, reels and reels of microfilm dating back to the mid-1800s. This is where my first hurdle came in, Enniskillen is in Fermanagh and consequently hold the information on all Fermanagh papers, yes these papers do cover Fivemiletown but Fivemiletown is in Tyrone and to view the Tyrone papers I would have to go to Omagh which is about 20 miles in the opposite direction, this means I will have to split whatever time I have between the two libraries. Not only will this be more time consuming it will also mean clocking up a few more miles. More information has come to light, suggesting that there might be more material on summer competitions involving Fivemiletown, in the local Dungannon papers which are in the Dungannon library. More travelling needed. So here I am in Enniskillen library looking at drawers of microfilm and thinking; what the f where do I start? Well I already had a start date of April 1888 so this seems the obvious year to start in but I decided to start at the beginning of the year rather than April. The Impartial Reporter is still going today so I decided to start there, loading up the microfilm I started in January the first publication of that year. Today’s papers are well organised with the main story getting the big headlines on the front page with the topics of the moment either being praised or criticised in the following pages, add in a few crosswords and TV listings in the middle stick the sports news at the back and this is pretty much a standard format for all newspapers today. In the late 1800s, it wasn’t the case, far from it, it was just all over the place, the front page is mostly adverts selling all kinds of remedies, jewellery and a lot of ships sailing to America, it being the only way to get there at that time. Sport doesn’t seem to be of much importance at this time and it appears each town and village sent in their own local news to be included in the next edition of the paper, this would cover pretty much everything Petty Session Cases, accidents, local roads and any local sports. On the right of each page you should see a list of seasons I have completed or at least started, it's a bit random, I just pick a year and see what I can find plus I have to split what time I have between at least two places of interest which means I might only have a fraction of the information that’s available. The links 1880s, 1890s, 1900s etc. is an overview of that decade for more details just click on the year you wish to discover. Do you have any Fivemiletown Football Memorabilia? Old family photos, newspaper clippings or match programmes. I’m looking anything at all connected with the club no matter how tenuously it is linked. All items would be treated with care, photographed, documented and returned to you in the same condition as we received them, thanks in anticipation. I have kept the spellings of names/places as they appeared in any documents I found. I strive for accuracy, but if you see something that doesn't look right, contact me!